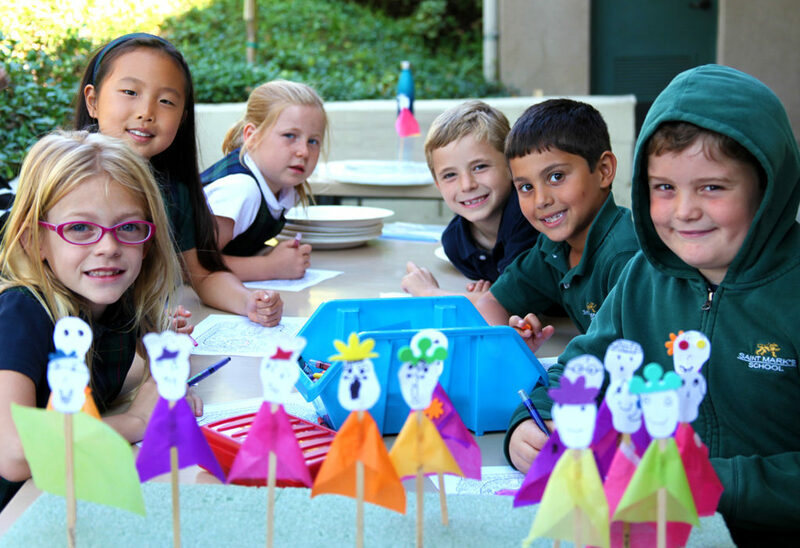 Spanish is offered in kindergarten through sixth grade. 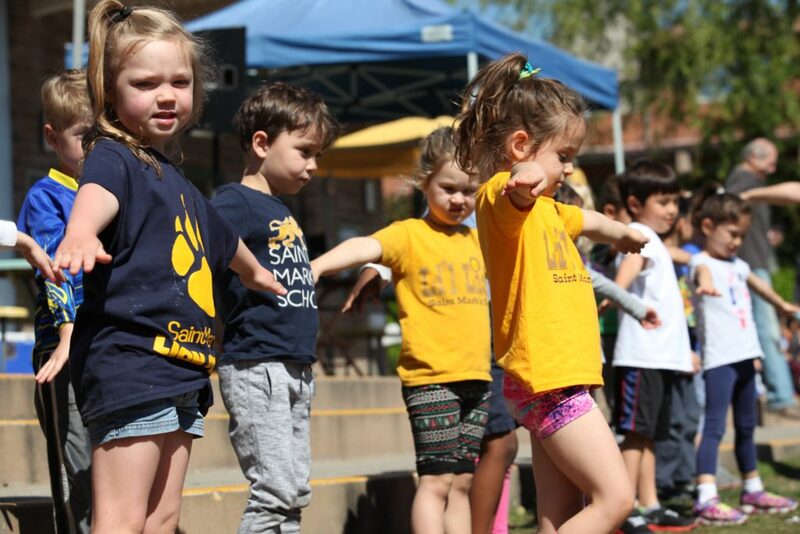 The Spanish program is designed to promote oral language development and writing fluency through a variety of activities, including songs, dance, storytelling, playwriting, skit performances, and daily conversations. Language and culture acquisition are complemented by field trips to local markets, churches, and Olvera Street. The program also includes school traditions such as the creation of a “Day of the Dead” altar in early November, chocolate caliente in the winter, and various cooking activities. The Spanish program provides students a global perspective in their understanding of today’s world. 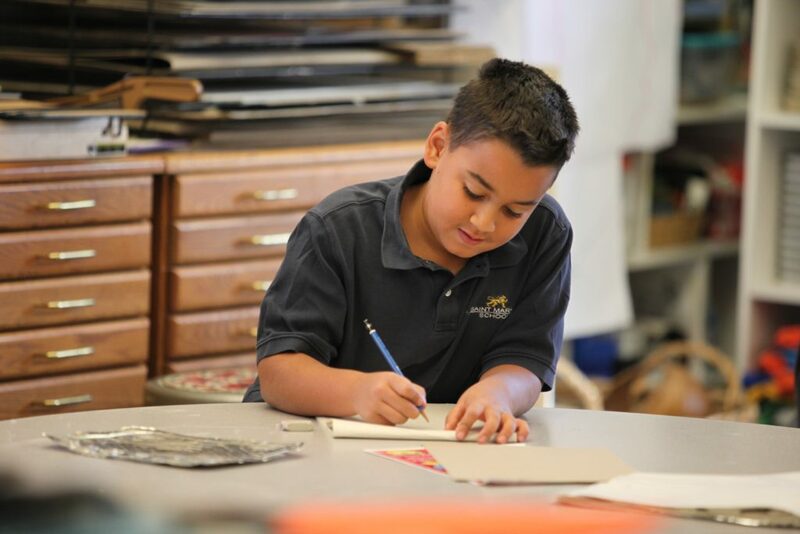 In art class, students in kindergarten through 6th grade participate in challenging hands-on activities that foster creativity, exploration, innovation, and experimentation, encouraging each child to grow as an individual. Through practice observing and discussing their own work, the work of their peers, and diverse artistic traditions, students also develop empathy and an understanding of diversity and differences. The art curriculum is designed to both support and expand on classroom learning, integrating with multiple subject areas. Students develop their skills in a wide variety of media and processes as well as the basic principles of art. With almost 10,000 books, the Saint Mark’s library is a rich resource for students. The library’s collection includes age-appropriate picture books, chapter books, and nonfiction titles. The librarian helps to inspire in students a love of reading by working personally with each child to find books of interest at the right reading level. Kindergarten through third-grade students visit this warm, welcoming space each week to learn about literature and develop library and research skills. The librarian reads engaging stories covering a wide range of topics, from biographies and poetry to current events. 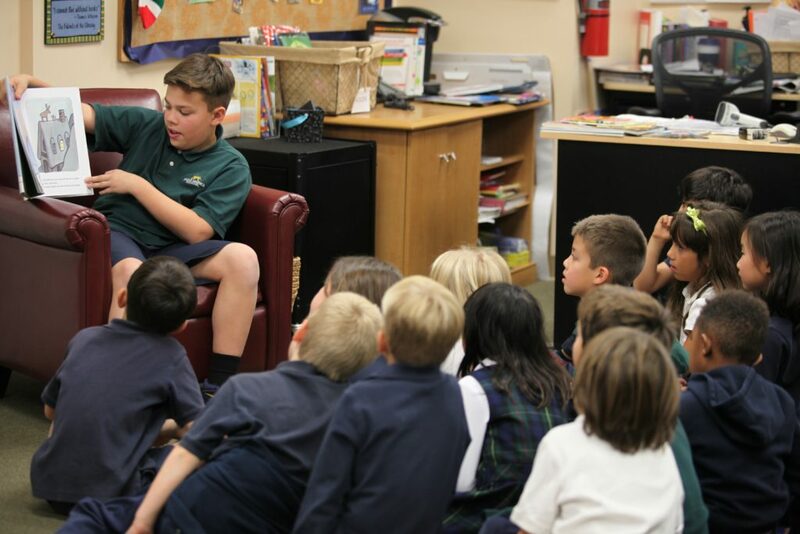 Upper-grade students learn to use the library as a source of information for research reports and other classroom assignments. The librarian also leads the Junior Great Books Program for fourth through sixth graders. Preschoolers are visited by the librarian twice a month for storytime. After school, students may come to the library from 3:30 to 4:30 pm for supervised study hall. 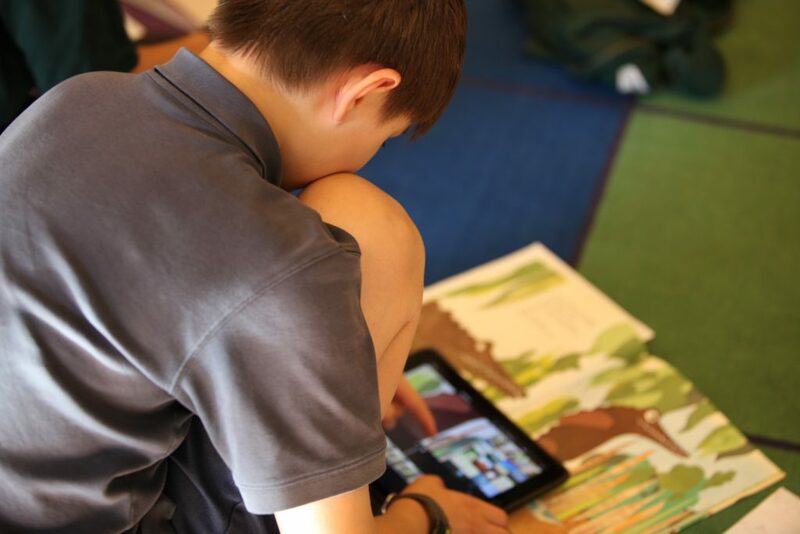 Technology education is integrated into the curriculum at Saint Mark’s. Students learn how to identify and solve problems by using creative thinking and the technological tools at their disposal. Students also learn about digital citizenship, including issues such as email etiquette, safe and responsible research, and digital footprints. Students in first through sixth grade spend time in the technology classroom weekly. The school provides every fifth- and sixth-grade student with an iPad to use throughout the year. Students visit the Innovation + Design Studio for technology class every week. The I+D Studio was recently renovated to become a more flexible learning space. Our architects, HED, provided a short video highlighting the many ways we use the lab. The motor development curriculum in preschool is based on the natural development that occurs in each child. The year begins with bilateral to unilateral movements and then to cross lateral movements. Children are exposed to many creative ways to move their bodies while developing physical and social skills that promote high self-esteem. Motor development in kindergarten further enhances the motor skills most children have mastered in preschool. It also adds skill development that they will need in first grade. There is time for individual, partner, and group activity during motor development. Beginning in first grade, students participate in physical education classes. The physical education program promotes both physical and social development of the students. Children develop fine and gross motor skills as they take part in individual activities, small group games, and team sports. The PE program emphasizes cooperation, teamwork, and sportsmanship. Students learn science through inquiry-based instruction. 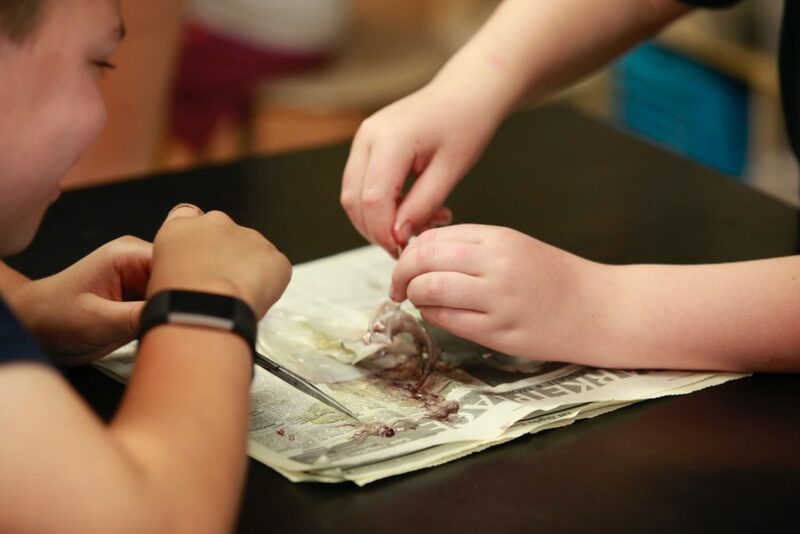 Students construct an understanding of scientific concepts through their own investigation and analyses using the Full Option Science System (FOSS). The program promotes interactive experiences. Students thrive in this efficient learning environment, working productively in collaboration. A detailed assessment program measures students’ learning and ability to apply what they have learned. The scope and sequence of the program covers life, physical, and earth science, as well as scientific reasoning, technology, and thinking processes. At the preschool level, children learn basic music competence. The school’s philosophy is that every child has a musical aptitude. 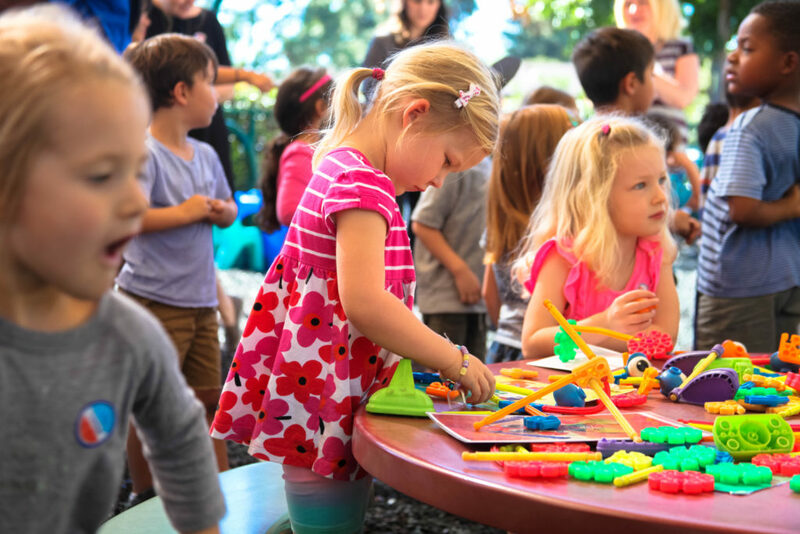 The goal of the preschool music program is to expose children to a variety of creative ways of enjoying music and movement. The Saint Mark’s music curriculum at the elementary level is a blend of the Orff-Schulwerk and Kodály methods. Students develop an understanding of fundamental musical concepts such as rhythm and pitch through singing games, part-singing, experience with pitched and unpitched percussion instruments, ukuleles, and recorders. In addition, students discover works like “Peter and the Wolf,” “The Firebird,” and “The Magic Flute” through careful listening and dramatic play. Students also experience the joy of performing by participating in seasonal programs and mini-dramas. 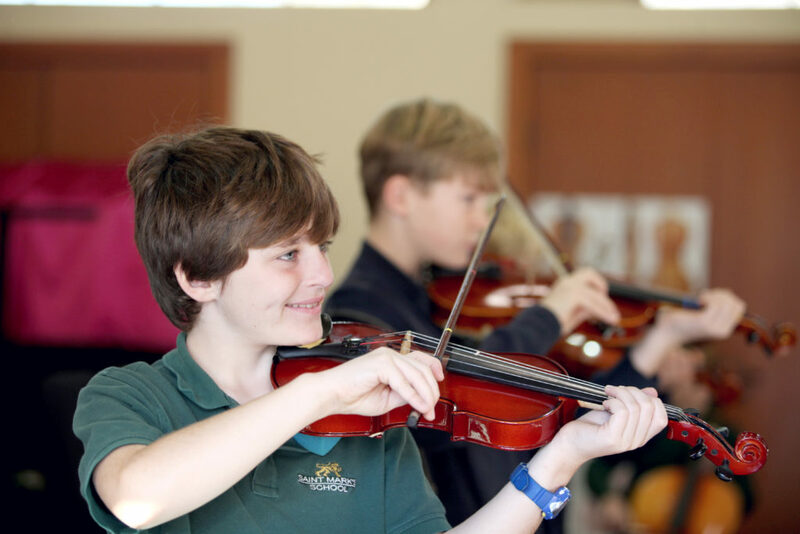 Beginning in third grade, students can participate in an optional strings program before or after school. Students learn to play violin, viola, or cello in a group setting and they perform beginning orchestral works by fourth and fifth grades.